Interesting release where the first half of the album is a mini-concept that deals with the story of Dracula. All of those songs have a great creepy vampire vibe to’em, so in theme, I definitely like it. I’ve held off on talking about this album for awhile because I’m having a hard time getting into it and I really don’t have much to say about it. The album is perfectly “good” and the musicianship is high quality– but it’s just not clicking with me. There’s no personal connection for me to this album, which is the first Helstar album I’ve ever bought and I did so based on the extremely high praise I was seeing elsewhere online. I enjoy the first half though as I think the gothic atmosphere is pretty cool, but I really lose touch with the album once “Benediction” starts up. What am I missing here? Why is this not working for me? Like I said, there’s nothing I can really point out as being wrong or bad, but I could really take or leave Nosferatu. I do think that the instrumentals “Perseverance and Desperation” and “Von Am Lebem Desto Strum” are beautiful pieces though. 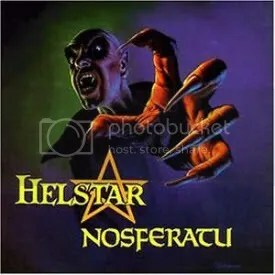 From what I’ve read, Helstar were originally a power/speed metal band and this album helped kickstart the progressive metal scene. There are some thrash-worthy moments though that remind me of Anthrax.